An announcement by Microsoft has officially signaled the demise of the famed email service Hotmail, with Outlook moving in to fill its place having finally shaken off its seemingly everlasting Preview status. 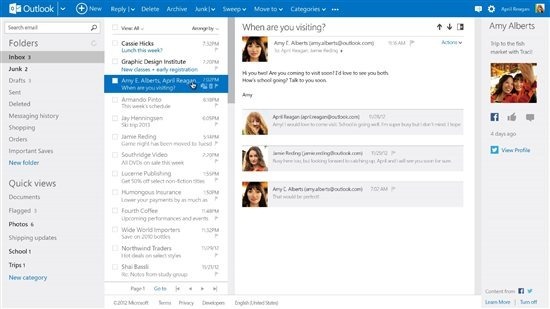 Although the end of Hotmail will perhaps be a poignant for a few within the Redmond camp, it has been a long time coming, and even though it seems like a big transition, the look and feel of Hotmail has borrowed from Outlook for a while now. Hotmail was purchased by the software maker-turned-hardware-enthusiast back in 1997, making its founders the tidy sum of around $400m. Since then, however, it hasn’t really advanced either functionally or aesthetically, and today is only an official note in a service which died years ago. Hotmail was once the de facto email service that consumers simply signed up to, but thanks to Google’s Gmail service, Microsoft has been forced to make some bigger changes as users migrated en masse, and with Outlook still carrying plenty of weight as a part of the Office suite, the re-branding decision was certainly a beneficial one. In case you were panicking that your current e-mail address would be changed from its current Hotmail.com domain, you’ll be pleased to know that this isn’t the case, so you won’t need to go through the tiresome rigmarole of notifying all of your contacts regarding a new email address. With that said, if you would like an Outlook.com address, you can register for one right now. The transition phase will take place gradually over the next couple of months, with all users seeing new Outlook style by the time Summer hits. If you can’t wait to see the back of Hotmail and wish to speed up the process, you can “opt-in” to the new Outlook service right away. The Surface maker claims Outlook boasts 60 million active users across, and that it is the fastest-growing email service around. A third of that number, or around 20 million have migrated (or “upgraded”, as Microsoft describes) from Gmail, or picked up Outlook as their first email client. Amid Microsoft’s many weak webventures, the Office suite has always stood tall, and remains the go-to productivity package for the vast majority. Thus, moving away from Hotmail and to a strong, secure and professional look and branding with Outlook will only but help Microsoft reinstate its place as a key player on the Web.